Many of us are quite attached to our cell phones. Some of us can’t walk across our bedroom without going back to grab our phone, and leaving the house without it is just out of the question. We’re so attached to our phones, that they occupy permanent spots in our hand or pocket. A stranger only needs to unlock our cell phones to get the keys to our lives: our schedule, work email, alarm clock, address book, social media accounts, health apps, streaming platforms and possibly, a few secrets. If the thought of losing your cell phone is mortifying than perhaps the next worst terror is listening to your angry text messages or romantic emails from someone other than your partner read aloud over dinner. That’s the tension behind Manolo Caro’s “Perfect Strangers.” The film’s premise is simple yet made suspenseful with a 21st Century twist. On the night of a blood red moon eclipse, a Mexico City-based group of old friends and their plus ones gather to watch the astronomical event, eat, drink and gossip. After a recent bit of news about another couple broken up by infidelity, the group gets the idea to play a game over dinner. Everyone deposits their phones in the center of the table, and any received text, WhatsApp message and phone call over the course of the next few hours is supposed to be shared with the group—no exceptions. This makeshift social pressure forces these friends to give up their phones—and subsequently, their dirtiest secrets—for a laugh. The movie’s not-so-subtle music cues heavily imply that this evening will not end well. The experience is something close to playing poker with someone who sighs loudly with every turn. We may not know exactly what cards they’re holding, but it can’t be good. Like Sidney Lumet’s “12 Angry Men,” James Ward Byrkit’s “Coherence” or Roman Polanski’s “Carnage,” trapping the camera in close quarters with troubled characters gives this movie a sense of claustrophobia. There are never enough windows to look out of, and few (if any) places to hide, or spaces to move around in. For most of the film, the camera is anchored to the middle of the table or hovering just outside of it, looking at the group as they look at each other. The group’s expressions shift from puzzled or shocked as they realize their friend or loved one wasn’t always honest. The door is out of frame and feels as if it’s moving further away as the night progresses. Additional problems at home become sensitive landmines ready to destroy the evening on the slightest misstep. After a few reveals, “Perfect Strangers” settles into a rhythm, and the suspense fades into expectation. As each secret is piled on top of each other like a shaky tower of Jenga blocks, we’re anticipating its noisy crash at any second. While each of the actors gets to have their showy dramatic outburst, the actor who plays Pepe (Franky Martín) has the tougher assignment. His personality fluctuates through reluctant, defensive, outspoken and outright confrontational moods. His is the most complicated story, and it brings one of the film’s more poignant conversations. 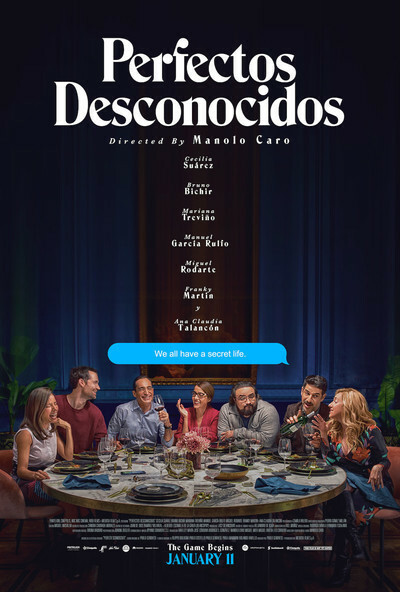 The Mexican remake of “Perfect Strangers” is actually the film’s seventh version (according to IMDb), with previous entries hailing from Italy, Spain, Greece, Turkey, France, and China. It’s a simple, stripped-down premise that transcends cultural specificity. Many people around the world are struggling with the addictive temptations our phones offer us. Worse yet, we’re still struggling with the basic task of trusting those we love. Maybe if given the right dinner party, we’d want to read what our friends say behind our backs or find out how our partner starts an affair while sitting next to you watching a movie at home. But as it happens in “Perfect Strangers,” there’s no taking back that ill-advised text, tweet, Facebook message, or email. We’re only left with its unintended consequences and a heavy weight in our chest and back pocket.